Awhile back my wife and I were enjoying one of our favorite dishes, Beef Burgundy (or Beef Bourguignon, if we really want to sound fancy). As I reached for a second helping, my wife looked across the table and said, "You know, you could make this." "No," Barb replied, "but you could make it sometime. It's really easy. The recipe is in my notebook." It sounded like a dare to me, so a month or two later I got home from work early and decided to give it a try. Sure enough, there in her recipe notebook was the Beef Burgundy formula, written in Barb's own hand. I started gathering the ingredients she had listed: two pounds of stew meat, some mushroom soup, two cups sliced carrots, eight ounces mushrooms, a can of red wine...wait a minute...a can of wine? This was a new one. Admittedly I have had trouble in the past searching for items in the grocery store, not knowing whether I was looking for a jar or a box or a bottle or a carton. (Where do they teach that kind of stuff anyway?) I knew you could buy wine in a box, but I had never heard of wine available in cans. And was there something special about canned wine over bottled wine? Baffled, I decided to get on with my task and postpone that ingredient until later. When Barb finished her workday, she called to say she was on her way home. I told her about my quest to cook dinner, but that I had a question. "What size can of wine do you use for the Beef Burgundy?" There was a pause on the other end. Then in a puzzled voice she asked, "Where did you find wine in cans?" "I didn't," I replied. "I didn't even know it came in cans." "But you specify a can of wine in your recipe," I pointed out. "Right," she said matter-of-factly. "After you scoop the mushroom soup out of its can, pour some red wine into the can, and that's how much you'll need." Perhaps I'm too literal, and I'm sure "a can of wine" made sense to her when she wrote the recipe down long ago, but I'm convinced something got lost in the translation. “I’m getting the tape measure,” I reply. “But I need it to see which pan is thirteen inches by nine.” I say. My wife looks at me as if I was born on Mars. “Never mind, I’ll get it,” she sighs. On aisle eight I found cans of tomato paste, cans of tomato sauce, diced tomatoes, minced tomatoes, but no cans of roasted tomatoes. 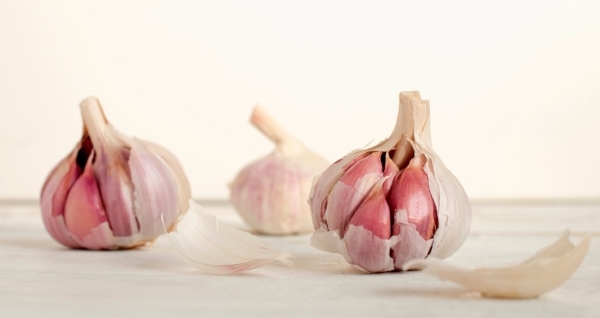 After I discovered that yes, roasted tomatoes do come in a jar, I looked at my list again and read, “three cloves of garlic.” I had seen the garlic in the produce section, so I returned and found an abundance of lovely white garlic heads. I chose three of the best, and put them in a bag. Once home, I followed the recipe carefully. It told me to finely chop the three cloves of garlic and sauté them in butter. I chopped up one of the heads and tossed it into the pan. As it sizzled, the kitchen filled with the definitive and pungent aroma. That’s a lot of garlic, I thought. Three of these might be more than we really need. So I put the other two heads of garlic away, and moved on. By the time my wife got home I had the dining room table set with our best china and lit candles, and the Shrimp Linguini was ready. We sat down and dug in. “And get this,” I told her, “I put in only a third of what the recipe called for. It actually specified three cloves, but I think that would be way too much.” (I couldn’t hide the pride I felt in my ability to modify a recipe on the fly.). I went to the kitchen and fetched the other two heads of garlic and presented them to her. “These are the other two cloves of garlic?” Barb giggled. “Nothing that can’t wait,” she said softly. “Sit down and let's finish this wonderful meal." Are you or anyone you know "kitchen challenged?" Feel free to scroll down and share a comment below. In case you're wondering; I now know that there are several cloves in one head of garlic. *Update July, 2018. What do you know? Wine comes in cans now!